Jungle Island is the home to 1,100 tropical birds, 2,000 varieties of plants and flowers, and the best trained bird show in the world. The park also features one of the world's largest crocodiles, reptiles, snakes, a ligor (mix of a lion & tiger), and orangutans. One of the newest attractions is a Hippo Water Slide, possibly the biggest inflatable water slide ever, standing 3 stories tall with a 40 degree drop. Don't miss the third incarnation of the Ichimura Miami Japan Garden, open 10am - 5pm Saturdays and Sundays. The garden is an exact replica of a Japanese Garden that was started in the 1950's in Tokyo. VIP Safari is a 90 minute guided tour of the animals with their trainers, available for parties of 2 or more. The safari includes lunch at the Lakeside Cafe, T-shirt, park admission, gift shop discount, and parking. 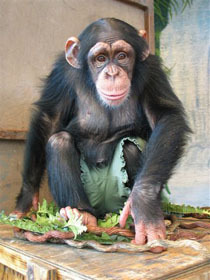 Wild Encounter includes 30 - 45 minutes with a baby chimpanzee or orangutan, baby tigers, and other exotic animals as available. Strollers & wheelchairs are available for rental. The facility is available for birthday parties, private, and corporate events. For more information, fill out the conference inquiry form. • Make a Right on JParrot Jungle Trail (1st exit after the bridge). • Follow the road around and under the causeway to the parking garage on the Left.